Progressive offers a complete line of EDI systems, customized for each application. All systems are custom design/build equipment. In every case, the customer’s requirements and preferences are considered prior to any design. 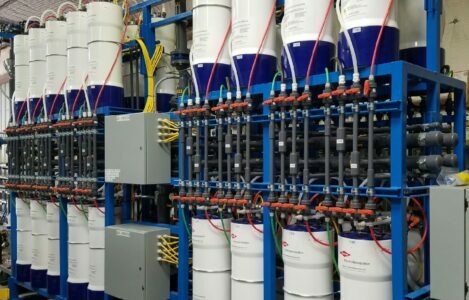 Electrodeionization (EDI) uses the water purification benefits of ion exchange resin while eliminating the disadvantages of chemical regeneration, which is done by combining ion exchange resin with electrodialysis. The elements required for the electrodialysis process consist of ion-selective cation and anion membranes, electrodes, concentrate chambers, dilute chambers and DC current. The result is electrodeionization, which is a continuous, chemical-free system which generates high resistivity water of up to 18 meg-ohm-cm @ 25°C).